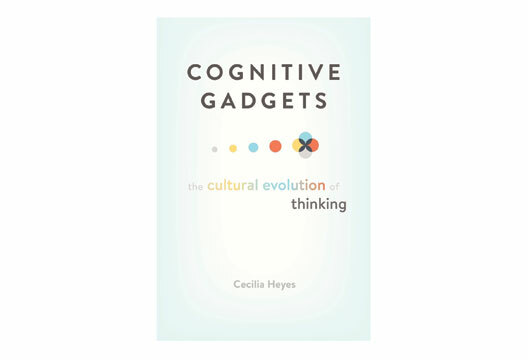 Cecilia Heyes, author of Cognitive Gadgets (Harvard University Press), spoke to us about the book and her theory. Could you set out the book’s main thesis? In humans, new cognitive mechanisms – new ways of thinking – have emerged, not by genetic mutation, but by innovations in cognitive development. These innovations have been passed on to subsequent generations, not via genes, but through social learning: people with a new cognitive mechanism, what I refer to as a ‘gadget’, passed it on to others through social interaction. And some of the new ways of thinking have spread through human populations, while others have died out, because the holders had more students, not just more babies. To acknowledge a debt and mark a contrast. The debt is to evolutionary psychology, which brought together Darwinism and cognitive science about 25 years ago. Following Steven Pinker, evolutionary psychologists say that distinctively human cognitive mechanisms – such as language, mindreading, causal reasoning, imitation, moral cognition – are ‘cognitive instincts’. I agree that these mechanisms are products of Darwinian selection, but I argue that the selection has been cultural rather than genetic. So, distinctively human cognitive mechanisms, like gadgets, come from human rather than genetic action, and they are small tools that make a big difference. Most human behaviour is controlled by mechanisms we have in common with other animals, but cognitive gadgets are what make our lives so different from theirs. What are the implications of thinking about thinking in this way? The cognitive gadgets approach, or ‘cultural evolutionary psychology’, implies that human minds are more agile, but also more fragile, than was previously thought. We are not stuck in the Pleistocene past with Stone Age minds. Social media, robotics and virtual reality are not threats but stimuli for further cultural evolution of the human mind, and well-targeted interventions have the potential to transform cognitive development. But we have more to lose. Wars and epidemics can wipe out, not just know-how, but the means to acquire that know-how. The cultural evolutionary perspective also opens new paths for research. Because cultural evolution is faster than genetic evolution, the cognitive gadgets approach suggests we can discover how new cognitive mechanisms are constructed by looking at contemporary and historical populations. We don’t have to rely on stones and bones to guess how cognitive mechanisms were put together by genetic evolution in the Pleistocene past. Through laboratory experiments and field studies, we can watch them being constructed in people alive today. To develop your theory you necessarily draw on wide multidisciplinary sources – were there any special challenges for you in this? I studied with a distinguished social psychologist, Donald T. Campbell, and I’ve done empirical work in comparative and developmental psychology, in cognitive psychology, and in social cognitive neuroscience, so it wasn’t too difficult to survey the evidence in those areas. And I enjoy reading philosophy of cognitive science and philosophy of biology – they’re my academic hobbies. But I had to work hard to get my head round some of the mathematical models of cultural evolution, and to make the book accessible to all interested parties – in psychology, neuroscience, anthropology, evolutionary biology, economics, and philosophy. Cognitive Gadgets is short book with a big message – what do you hope its impact will be? I worked really hard to make the book short because I know most psychologists are too busy to read books. Before I gave up my lab to become a ‘theoretical psychologist’ (strange how seldom one hears that term), I read almost nothing but journal articles. What do I hope for this book? That it will get people to re-examine their assumptions about human nature – how and why our minds are different from those of other animals – and encourage researchers, especially those in early career, to test the idea that distinctively human cognitive mechanisms have been constructed by nature, nurture and culture; that we learn from the people around us, not just what to think, but how to think it.